Machiko Kyō (京 マチ子, Kyō Machiko, born March 25, 1924) is a Japanese actress whose film work occurred primarily during the 1950s. She is known for her roles in Akira Kurosawa's Rashomon and Kenji Mizoguchi's Ugetsu. Machiko trained to be a dancer before entering the film industry in 1949. The following year, she achieved international fame as the female lead in Akira Kurosawa's classic film Rashomon. She went on to star in many more Japanese productions, most notably Kenji Mizoguchi's Ugetsu (1953) and Kon Ichikawa's Odd Obsession (1959). Her only role in a non-Japanese film was as Lotus Blossom, a young geisha, in The Teahouse of the August Moon, starring opposite Marlon Brando and Glenn Ford. Kyō continues to perform in traditional Japanese theatrical productions put on by producer Fukuko Ishii. 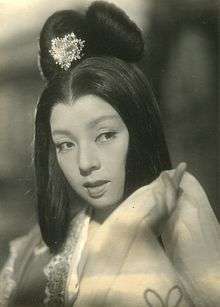 Kyō was nominated for a Golden Globe for The Teahouse of the August Moon, a great feat for an Asian actress at the time, and has been awarded many prizes, including a Lifetime Achievement Award from the Awards of the Japanese Academy. Wikimedia Commons has media related to Machiko Kyō.